This species is accepted, and its native range is Africa to Indian Subcontinent. 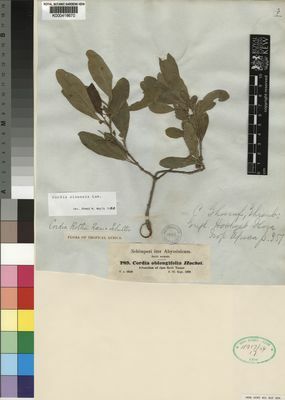 A shrub usually up to 4 m. or a bushy tree up to 8 m. high; branchlets angular, fulvous-tomentellous to subglabrous when young, glabrescent, often cream becoming grey or brown and lenticellate with age. Leaves opposite, subopposite or alternate; petiole 0.3–1.0(1.5) cm. long usually with some long pale hairs; lamina 3–9 x 1.0–4.5 cm., narrowly obovate to elliptic, rarely oblanceolate, with minute bulbous-based appressed or slightly ascending hairs and sometimes with scattered white bristles to subglabrous but often dotted with groups of cystoliths above, with minute bulbous-based hairs appressed in all directions or pubescent to subglabrous but usually with dense long hairs on the axils of the secondary nerves and along the midrib (sometimes not much evident) below, obtuse to rounded and sometimes retuse at apex, acute to obtuse and often slightly asymmetrical at base, margins entire to crenate or serrate to the upper half, papery to leathery, greyish-green or yellowish-green, with 5–7 secondary nerves on each side of the midrib. Panicle 1.5–6.0 cm. long, little-branched, terminal or axillary; rhachis and branches minutely fulvous-tomentose with scattered long pale hairs to pubescent, often glabrescent. Flowers male on pedicels 0.5–1.5 mm. long. Calyx 4–5 mm. long, narrowly campanulate, irregularly 3–5-toothed, pubescent or minutely fulvous-tomentose outside, strigose inside. Corolla white, glabrous; tube 2.5–4.0 mm. long, cylindrical; lobes 4, 3.0–4.0 x 1.2–2.0 mm., oblong to narrowly obovate, rounded at apex, reflexed. Stamens 4, inserted at the corolla-throat; filaments 2–3 mm. long, glabrous; anthers c. 1.5 mm. long, oblong. Ovary c. 2 mm. long, ovoid, glabrous; style 5–7 mm. long, first-forked at 2.0–2.5 mm. and with stigmatic branches 2–3 mm. long, clavate. Fruit 12–15 x 8–11 mm., ovoid or ellipsoid, apiculate, glabrous, yellow, orange or reddish when ripe, surrounded at the lower third by the widely enlarged, usually cream, campanulate calyx; mesocarp fleshy; pyrene c. 8 x 7 mm., ± rhomboidal or quadrangular in cross section, 1–3 seeded. Tangled shrub or usually a spreading often several-stemmed tree 3–10(–12) m. tall; young stems ridged, slightly pubescent; young bark pale, smooth but later brownish grey or yellowish brown to almost black, densely longitudinally fissured and very rough; innovations often ± velvety, fawn-coloured. Leaf-blades typically narrowly oblong-elliptic or oblanceolate to oblanceolate-obovate, mostly rather longer than in species 16, 1.5–11 cm. long, 0.6–4 cm. wide, rounded at the apex, rounded to cuneate at the base, entire or crenate near apex or rarely crenate all round, glabrous to pubescent and sometimes slightly scabrid above, nearly always with longer hairs in the nerve-axils and along the midrib beneath; occasionally somewhat asperous on both surfaces; petiole distinctly developed, up to 1.3(–1.8) cm. long. Flowers sweet-scented in rather laxer panicles than in species 16, 6.5 × 7 cm. ; peduncles and secondary axes up to 1.5–3 cm. long; pedicels 2 mm. long. Female:corolla-lobes 3–4 mm. long, 1.3–1.5 mm. wide; filaments 2.2 mm. long; style 2.5 mm. long with branches 2 mm. long and stigmatic branches 2–4 mm. long. Male:corolla-lobes oblong, 4.5 mm. long, 1.5 mm. wide; filaments exserted 3.5 mm. 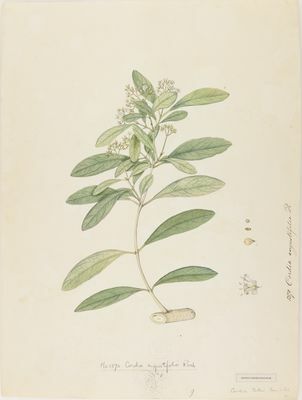 Calyx glabrous to pubescent outside; tube cylindric-campanulate, 4–4.2 mm. long including 0.5–1 mm. long low rounded lobes. Corolla creamy white; tube 5 mm. long. Male:corolla-lobes oblong, 4.5 mm. long, 1.5 mm. wide; filaments exserted 3.5 mm. Female:corolla-lobes 3–4 mm. long, 1.3–1.5 mm. wide; filaments 2.2 mm. long; style 2.5 mm. long with branches 2 mm. long and stigmatic branches 2–4 mm. long. Fruit yellow, orange or bright red, 0.7–1.3 cm. long, 7–9 mm. wide, mucilaginous and edible. Mainly riverine, in tree belt or tangled scrub, sometimes in scrub and open thorn-bush of Acacia, Commiphora, etc. subject to inundation, ground-water forest; 0–1800 m.
A shrub or small tree up to 16 ft.
Ovoid, pointed fruits on a saucer-shaped calyx. Cordia cuneata B.Heyne ex A.DC. Martins in Flora Zambesiaca 7(4): 69 (1990), pro parte. Warfa, Nordic Journ. Bot. 9: 649, figs. 1,2 (1990). Täckh., Student’s Fl. Egypt, ed. 2: 436, t. 152 (1974). Meikle in Israel Journ. Bot. 20: 22 (1971). Heine in Adansonia, sér. 2, 8: 186 (1968). I.M. Johnston in Journ. Arn. Arb. 32: 11 (1951). Poir. in Encycl. Méth. Bot. 7: 49 (1806). Lam., Tab. Encycl. 1:423 (1792).